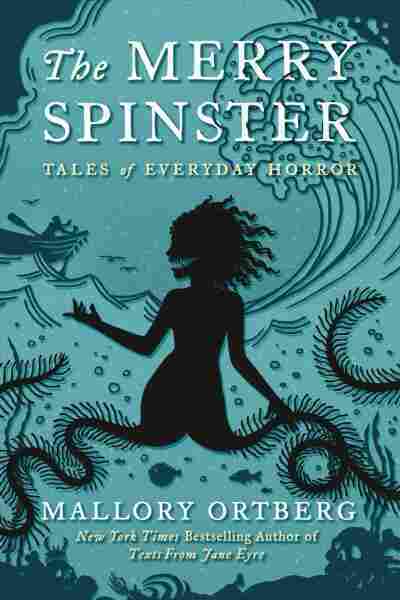 In Daniel Mallory Ortberg's Version, The Little Mermaid Inhales Souls His new book The Merry Spinster infuses old stories with psychological horror, tackling issues of gender and property. "The blood was already there," he says. "I was just moving the blood around." The Merry Spinster is one of the most anticipated books of the spring. Author Daniel Mallory Ortberg has recast classic tales, including "The Little Mermaid," The Velveteen Rabbit, "Beauty and the Beast," and even parts of the Old Testament, to make them resonate with new takes on romantic love, property rights, abusive relationships, gender roles and the stuffed animals we hold dear — and their unsparing lack of sentimentality. Ortberg is the co-creator of The Toast, an important website for feminist writing. "I can accuse myself of only wanting to rewrite classic stories from a very young age, so that was — I think — already kind of a given," Ortberg says. "But I had also found, as I was rewriting fairy tales, I was having a lot of fun upsetting myself, and I thought, 'I bet other people have fun being upset sometimes, too.' And it turns out, we do." You know, the blood was already there. I think often of The Velveteen Rabbit, the original version. There's a character called the Skin Horse. That's just his name, and it's because he's made of skin. That's just as upsetting a visual as I think you can find in a children's story. So it didn't feel so much like I was adding blood so much as I was just moving the blood around. I gotta say, when you introduced me just a minute ago, I felt a little bit on the verge of tears. It was extremely powerful, but it's also felt like a real relief, 'cause one of the things I was really anxious about was I was not sure that I was gonna come out in time for the book tour. And one of the things that I was really anxious about was the thought of people saying, "Hey, lot of shifting gender roles in your book. What's going on there?" and having to say something like, "Ah, no reason. Just interesting, just love to think about thought experiments, nothing going on over here." So to not have to do that is a real relief. Well, what's funny is, it is also interesting to me. Like that is truly something that I think I would have tackled, regardless of what I was going through in my personal life. But it was also very funny to become kind of consciously aware of what I was doing about half-way through writing the book. So some of it certainly just had to do with things that were on my mind a lot. And some of it also had to do with the fact that in fairy tales, like especially the Aarne–Thompson classification system, you can kind of predict what's going to happen based on the combination of someone's gender, their role within their family, and their relationship to, say like, animals or magic. And I like very much that fairy stories often have a sense of morality that's really different from what we might consider moral, that's just as ordered and just as precise but has no relationship to what we think of, "If you do x, y will be the natural consequence." And I liked the idea of just adding gender into that process of just like, "OK, if we mix it up and rotate it, how does it look?" That one was really — I think the narrator in that one is a little bit distant, like it's not clear whether or not this narrator thinks of themselves as belonging to the mermaid population or outside of it. And it is very, like as the story progresses, it becomes very clear just how different the way that the mermaid and her family view things, like a soul. I like very much that fairy stories often have a sense of morality that's really different from what we might consider moral. And it's not malicious, but it's completely disrespectful of something like physical autonomy or what we would consider a right to privacy. Like it's not — she doesn't wish the prince harm, but she knows what she wants from him, and she has justified it completely according to her own worldview, and the idea of what his worldview might be does not enter into it. The great news is you can be a feminist and transition easily in a walk — not an issue. But yeah, it is — there are ways in which it felt painfully ironic, and there were ways in which it just felt like, "Well, there's nothing to be done about that." Just as the sun rose this morning, I am dealing with these feelings, and these impulses and this wish. And nothing about this isn't contiguous with the things I've loved and cared about before. Nothing about this is in any way a rejection of the kind of life that I've had before. I lived my life in a certain way for as long as it was possible. Ultimately, I came to a point where I confronted and acknowledged something that I hadn't wanted to for a long time, and something new is happening now. But it's not as different as I thought it might've been, or it's not like, "Oh man, really shooting off in a different direction." I'll say it like that character said in that story ["Cast Your Bread Upon The Waters"]. Just like, you know, that character says, "My son Johnny was very beautiful, and I love him." Mallory Ortberg is beautiful, and I love her. Samantha Balaban and Barrie Hardymon produced and edited this interview for broadcast. Sydnee Monday and Petra Mayer adapted it for the Web.